Jesus Alvarez is a Financial Aid Representative at Cal State Northridge. He was kind enough to make some time for us to get information on the financial aid process when entering any college or university. Project Boon: What type of financial aid is offered? Jesus Alvarez: That varies on the school. The first thing, in a community college(CC), there is the BOG (Board of Governors) fee waiver. Most of the time when you apply to the community colleges they’ll present that to you so I would say that’s the first thing they [students] want to probably ask. Beyond that it’s filling out the FAFSA application, those are federal funds, and so right now is a really good time to fill this out because California has the priority date. You can fill it out after March 2nd, but if you’re filing that before March 2nd there are some other benefits to that, I’ll cover that in a second…so that’s available for citizens and permanent residents, if the student is not a citizen they can apply for a Dream Act application so that’s an option too. There is also the Cal Grant, so I’m talking to someone in California…That’s usually something that the High School would have helped out with; it’s still good for the student to ask their main office about it. If they’re transfer students from a CC to a University, they want to talk to their financial aid office about that …its wise for students to follow up on that. Anyone that is out of California, each state does have specialized funding so it would be wise for them to follow up, basically going to their High School office or college, however that is set up. PB: How much debt do students usually have when they graduate? JA: That can also vary. Let’s say you come from a low income, if you apply for multiple types of aid, it may be enough to cover the classes. With the cal grant, federal funds, and some scholarships it may be enough to pay for everything going to the end of school. I’m coming from the perspective of a state school [Northridge], so I know it’s reasonable what it costs here. Now you can be getting into student loans, and those, when you fill out the FAFSA application you first get offered Stafford loans, if that’s not enough the next steps are taking out loans with a parent. They’re called a plus loan or a private loan. Getting back to the debt, if you’re applying for scholarships and there’s enough funding, you may not have to put yourself into debt. You also want to weigh out what your major is going to be vs. what your income is going to become. So, if you’re in the high sciences and you’re bringing in a lot of money, you can weigh that out a little bit too. You want to be careful what you’re getting indebted to and what your career is going to be, but I wouldn’t let that discourage them. PB: I know a lot of students get part-time jobs and whatnot to try and get some extra money, so how does work-study actually work? JA: Well work-study is designed to be a part-time job because your school is your priority and so it’s designed not to give you 40 hours a week. The benefit of that is, you know, it does give you a lot of extra spending money, and usually, if you’re a work-study student, it’s understood that your classes are your priority, so they want to work with your schedule. What’s good about that too is when you fill out the FAFSA one of the questions is asking “are you interested in work-study and interested in loans.” That is wise just to say yes. It doesn’t mean that you’re going to have to do it, it’s just showing your interest in it. That also justifies the program still sticking around, so in the bigger picture, it helps the whole program if you even show interest in it. PB: Should you still apply even if you don’t think you’ll get any aid? JA: Yes, you should apply because even if you get student loans, right now the Stafford loan’s interest rate is 4.45% annually, that rate is lower than your credit cards, so the rate of debt on student loans is much, much better. Just apply to fill it out, and if it’s offered to you and you’re able to pay and not use the loans, that’s great. If you’re coming to a point where it’s a struggle, you have a resource. Also, sometimes the scholarships you apply for may ask for an Estimated Family Contribution (EFC). That number comes from the FAFSA so in a kind of sneaky way they’re saying, “Hey we want to give you free money but why don’t you fill out a FAFSA application to see if you can get more money that way.” So they’re indirectly making you fill it out, and there are benefits to that. It doesn’t hurt to do it, it’s a free option online. 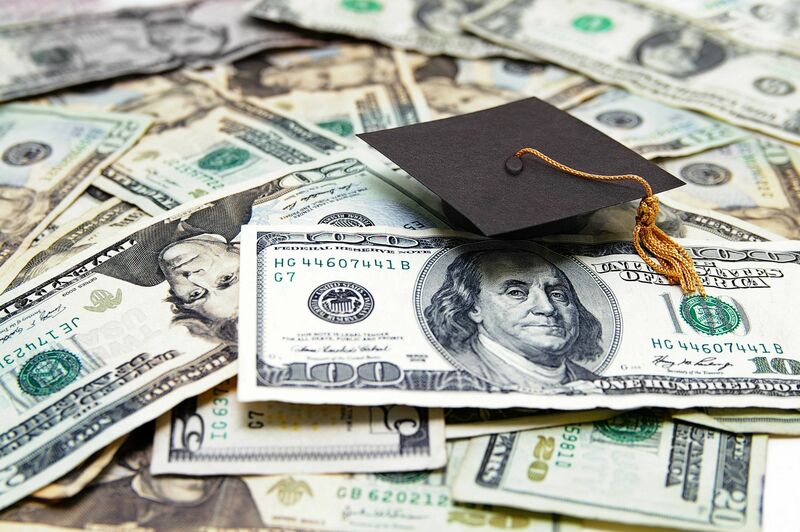 PB: If you receive a scholarship, does your financial aid package get reduced? JA: There is a thing called Cost of Attendance, there’s a limit to what you can get. If you look at your original financial aid…within that limit if they already offered you some grants, free money, and loans and the scholarships fit in there, they start taking away from loans. You have to really hustle a lot to get so many scholarships that it’s taken away. Either way, if you’re getting scholarships and they take away some of the free money, you’re just getting more resources to help pay for your schooling. It can factor into that but don’t let that intimidate you. Your goal is to go to school, and if some resource is going to pay for it versus you getting into debt, that’s your best move so you should do that. PB: Should I wait for my parents to file their taxes to submit my application? JA: Well, right now it’s called a prior, prior year. This is kind of a newer process, so the 2018-2019 application is based on 2016’s income. Before you could always fill it out without the taxes, it allowed that. It’s now even easier to understand because it’s asking for 2016’s income, you’ve had a whole year to file them, so there’s no real excuse not to do it now. PB: How does the application differ for early admission students? JA: Well the FAFSA is just asking for information, so if you’re a student or not, you can fill it out. It’s good for people as undergraduates, graduates, even parents who are thinking of going back to school. Again, I’m talking from a state school, so the masters and doctoral student can get state grant money from us. It’s based on availability, but it doesn’t hurt to get it done. PB: How do you get started? Where can I get help filling out the application? JA: Just go to the website and start filling it out, you’ll see it’s not that hard. It asks for a FAFSA ID, and that serves as your signature. Bottom line is everyone is online, everyone has applied for things, and it just asks you questions. Even with the tax information, if you’re looking at a 1040 it says, “okay on line 37 of your 1040, what’s that number?” you know, it’s not hard. You do this every year and use the same ID each time. PB: What is the difference between a subsidized loan and an unsubsidized loan? JA: A subsidized loan has no interest while you’re in school, which is nice. That’s the first one you want to take out. Six months after you graduate or stop going to school, you have ten years to pay it off. That’s when the interest rate kicks in. Going to the unsubsidized loan, it does accrue interest, so at the end of the year, that loan has gotten bigger by 4.45%. My nephew is taking loans out so what we’re doing as a family is we’re paying the interest while he’s in school. You can do that to kind of help out. Going back, subsidized is the better of the two, both of them you’re not paying while you’re in school. The first thing when you first get a loan, it is mandatory to take loan entrance counseling. Then, when you graduate or get out of school, it is mandatory to take loan exit counseling. PB: Do you have to accept the full amount of loans you receive? JA: No. You do not have to accept the loans; it allows you to alter it to a lower number. Again, should you have any questions, it’s just a matter of calling your financial aid office and asking them. PB: Can you expect to get the same amount of financial aid each year? JA: If your income is pretty much the same, it’s very likely it should stay about the same. PB: What are the deadlines for applying? JA: For priority, it would be by March 2nd, but don’t let that stop you from applying. You can fill it out anytime. JA: Let me add one thing, we didn’t go over this. When we get the FAFSA sometimes, there’s verification, so we’ll ask for paperwork, and that can delay the financial aid a little bit. This is something just to make sure they need to follow up on their emails, and if they get any emails with questions they need to contact their financial aid office, it’s really important.